The collection of the Simon Silverman Phenomenology Center is devoted to the phenomenological movement that was inaugurated at the turn of the century by the German philosopher Edmund Husserl, and that has been further advanced by figures such as Heidegger, Merleau-Ponty, Sartre, Arendt, de Beauvoir, Levinas, and Derrida, up to the current work done by Michel Henry and Jean-Luc Marion. The Center's collection also maintains a special interest in two precursors to phenomenology, Kierkegaard and Neitzsche. Literature in phenomenology is conceived by the Center rather broadly and embraces phenomenology as it reaches out into existentialism and other contemporary schools of continental philosophy, but also as it lives in phenomenological psychology and phenomenological approaches in the philosophy and ethics of communication and rhetoric, and in theology. In addition, the Center acquires books in all fields where a phenomenological approach is used. Thus, the Center has holdings in such fields as geography, music, ophthalmology, pedagogy, law, and nursing. 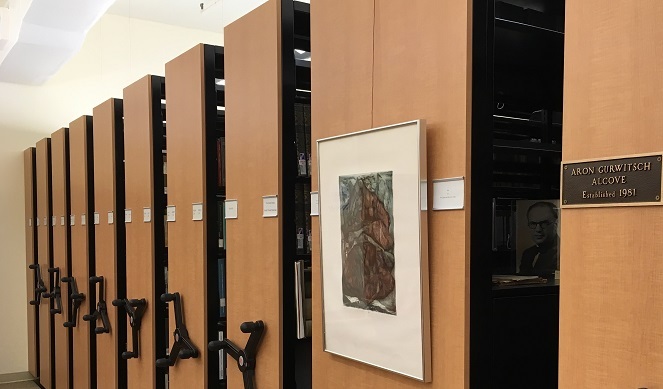 The acquisitions of the Silverman Center fall broadly into two classes: the Phenomenology General Circulating Collection and the donated Alcoves/Collections. The Center actively seeks donations of the entire personal libraries of retired or deceased scholars in phenomenology. These libraries are kept intact in separate areas of the Center. Each Alcove contains the personal library of its named benefactor, complete with marginalia notes in their books. Each Alcove also contains archival collections of papers, manuscripts, notes, correspondence, and other materials of the named benefactor. The Silverman Center also has a formal commitment from one other scholar for their extensive personal libraries upon their death. The Center is an official branch of the Husserl Archives of the Catholic University of Leuven, Belgium. The unpublished transcribed papers of Husserl are available for consultation at the Center. The Center contains the Moser transcripts of Heidegger's lectures from his Marburg period. The "Penséees repensées," the posthumous papers of F. J. Buytendijk (the founder of phenomenological psychology), holographic manuscripts in the Dutch language, are available at the Center. The Center serves as the repository for the archives of the Heidegger Circle. The Center is the official archival repository for the World Phenomenology Institute founded by Anna-Teresa Tymieniecka. The Center holds the archival collection of Karl Stern's manuscripts, personal papers, and correspondence. The Center contains photocopies of the English translation of Lacan's Seminars 6 and 9. The Center holds a small collection which includes some personal correspondence and papers. The Center contains a small selection of Fr. Henry Koren's correspondence. Fr. Henry Koren. Duquesne University Archives, Duquesne University, Pittsburgh, PA.
Karl Stern. Karl Stern Collection. Simon Silverman Phenomenology Center, Duquesne University, Pittsburgh, PA.
Rev. von Kaam. Duquesne University Archives, Duquesne University, Pittsburgh, PA.